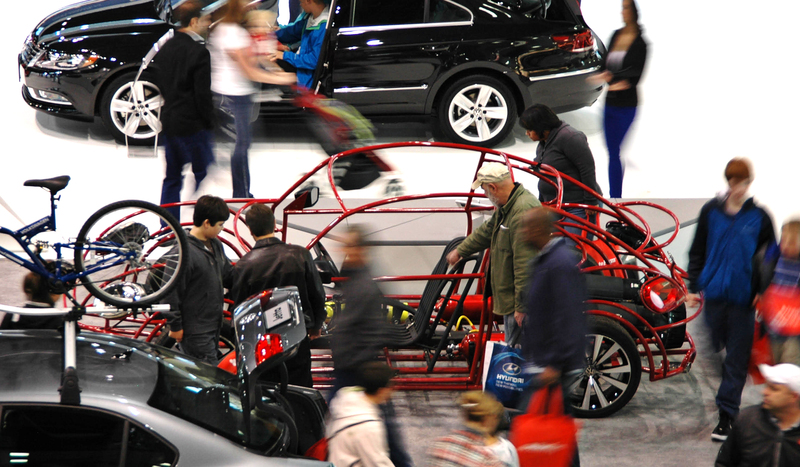 We took a trip to Century Link Field Event Center last weekend to check out the 2013 Seattle Auto Show. The big auto makers of the World had their 2013 line-up on display and we wanted to see if there was anything new and exciting worth drooling over. Despite the lay-out being very similar to last year and seeing only a handful of cars that we’d actually consider “new”, we were happy to have found a few subjects to capture through the lens. It was also pretty crowded this time around and the same lighting conditions made capturing these images without a tripod a bit more challenging, but we seemed to have made out ok. The two level show featured most of the “big boys” upstairs. Models from Rolls Royce, Bentley, a Bugatti Veyron, a pair of McLaren’s MP4-12Cs, a Lamborghini Aventador and Murcielago, and Jaguar’s XKR-S in “French Racing Blue” were a few of the top-dog residents on that level. They were joined by the new 991 Porsche 911 Carrera, a Mercedes SLS AMG, and Aston Martin’s gorgeous line-up, not to mention a few other high end makes and models. Wandering downstairs, we ended up in the Volkswagen/Audi section where the new Audi RS5, S7, and S8 were on display along with other models we had already been familiar with. It looked like Volkswagen brought out the same line-up from last year, adding the Golf R that didn’t make it last time. They also put the Shark Week VW Beetle on display, a kid favorite. To see the rest of our 2013 SAS collection, click here.